As part of our mission for a more competitive and FUN War of Emperium, we would like to invite strong guild from different server to join us. 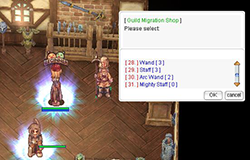 Guild will no longer need to wait and grind to reach max level and job to participate our featured VANILLA WoE. Must have atleast 12 active WoE members. MUST be active on other server WoE. Need to submit WoE Video Link. Need to submit Guild group photo. All MUST be using PC Client Only. * Complete +7 Classic Equipment and Cards. * Complete +7 Classic Equipment Set of your choice. You will be presented a wide range of CLASSIC equipment and cards listed below. Only gears worn may be brought outside when you exit the room. Step 2. GM Team will validate/evaluate your guild. Step 3. When approved, ask your team to install client, create account and make 1 novice character. Step 4. Submit list of IGN (Character Names) to the evaluating GM assigned. Step 5. Upon receipt of your list, guild leader will receive @claim code. Step 6. Guild leader will receive 1x Emperium and Invitation Letter when claimed. Step 7. Create Guild and invite all your members. All members must be online during the claim.